LAST CALL by Sarah Ballance – Romantic suspense for just 99 cents! LAST CALL is available from: For the Muse Publishing, Amazon, Barnes & Noble, and Smashwords (formats: .mobi, .epub, HTML, PDF, RTF, LRF, PalmDoc, and Plain Text). Click here to add to Goodreads or here for reviews. Rhys Clark swore and jerked her foot from the murky puddle that had just claimed one of her new running shoes. Perfect. The day was now officially perfect. Blaming him was easy enough. She didn’t know which required more nerve on his part—leaving town or crawling back—but both events left her bitter and raw. And wet, she grumbled inwardly. With the sky spitting rain and the occasional pellet of sleet smacking her face, she should have skipped her evening jog. The street was little more than a concrete alley of shuttered businesses, and the bleak weather amplified the emptiness. But tonight, with Nick hot on her mind, running through the cold was her last ditch effort to return to her senses. Another blast of icy air howled through the narrow street. If she hadn’t been standing still, she probably wouldn’t have heard the shouting that followed. A few months ago, an altercation wouldn’t have been unusual in this part of town. But the whole area was under reconstruction. Local crime dissipated to nothing with the razing of several apartment buildings, and until now Rhys had long found her route to be a place of solace. She glanced around as the voices drew closer and more intense. Rapid footsteps smacked the wet pavement. Then the echo of a gunshot cracked the night. Where fear left her paralyzed, instinct insisted she get out of sight. She looked around and found an unbroken expanse of concrete wall offering few options. Heart pounding, Rhys ducked into the recessed doorway of a vacant storefront and hoped the deep shadows would keep her concealed. Terrifying seconds passed. The sound of her own suppressed breath roared in her ears. Voices came, clearer this time. Close. “If we screw this up…” The words, terse and hushed, were encapsulated in panic. A hit? Rhys shuddered, fear scaling her spine. A professional hit would have been silent—something not accomplished by the gunshot or the ensuing conversation—but in this game, experience wasn’t always a prerequisite for willingness to pull the trigger. Two years of undercover work had taught her as much. Rhys froze, waiting for the voices to pass. But luck was not on her side. Rather than drawing away, the footsteps ceased. Hope crumbled. The voice was far too close. Had they seen her? She dared not move. Through her lashes, she saw nothing in her narrow view of the dimly lit street but dirty puddles and the occasional bit of trash plastered to wet pavement. She prayed they didn’t look her way should they walk past. She loves creating unforgettable stories while putting her characters through an unkind amount of torture—a hobby that has nothing to do with living with six children. (Really.) 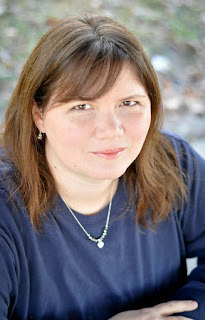 Though she adores nail-biting mystery and edge-of-your-seat thrillers, Sarah writes in many genres including contemporary and ghostly paranormal romance. Her ever-growing roster of releases may be found on her website. Thanks so much for hosting today, Heather! MUAH!